Ex-WWE superstar Phil “CM Punk” Brooks is no stranger to controversy. This time, it’s followed him into the realm of video games. It all began when MMA Junkie reporter Mike Bohn tweeted some new info about EA Sports UFC 2, which releases in March. 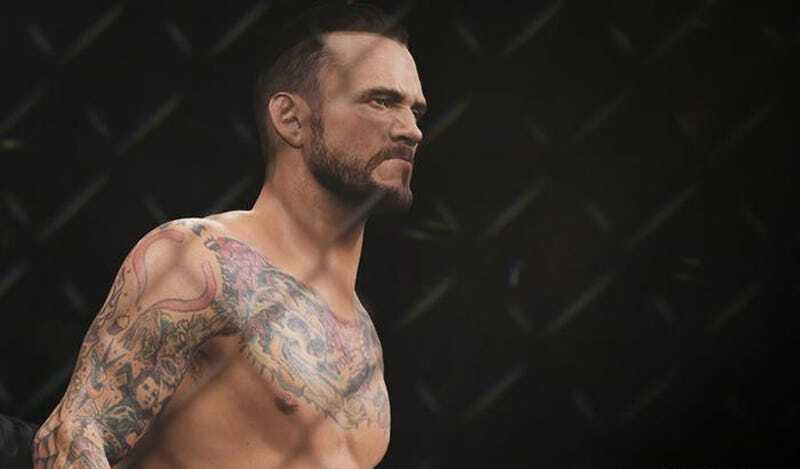 He noted that CM Punk—a former WWE superstar who’s spent the past year or so training to fight using The Real Punches in the UFC—has an in-game rating of 85/100. It’s not the highest rating the series has ever bestowed, but it’s pretty damn high for a dude who currently has a massive, abyssal zero MMA fights to his name. (For comparison’s sake, Martin Kampmann, a recently retired fighter with 27 fights, has the same in-game rating.) Punk’s UFC debut keeps getting pushed back, too—most recently due to a nasty shoulder injury. He’s no spring chicken, and at 37 years of age, he’s not getting any younger. Some pundits speculate that he’ll never make his debut at all, despite training with the extremely legit folks at Roufusport, where they do things like this legendarily insane kick on a semi-regular basis. Many MMA fans feel like Punk’s deal with the UFC (despite his near-complete lack of training or any sort of amateur fighting background) cheapens the sport. When Brock Lesnar made the jump, these fans point out, he at least had a decorated NCAA wrestling career behind him. The idea of an aged, injury prone Punk stepping into the Octagon feels to many like a publicity stunt, a pugilistic circus act. His rating in EA Sports UFC 2 only adds insult to injury. For what it’s worth, Punk seems to be taking his prospective UFC debut pretty seriously (as would most people who don’t love the idea of getting punched in the face until they’re unconscious or dead). Also, he claims it’s the UFC who was chomping at the bit to announce his signing. If he had it his way, they’d have waited until he was ready to fight for sure—rather than going through all this “will he, won’t he” hoopla. Dang, CM Punk. That’s cold. And probably inaccurate? But still: cold. Update (1/12/16 1:55 PM): I reached out to EA, and a rep told me that Punk’s stats have not necessarily been finalized yet. We’ll see if they change in the next couple months.